Animal Defenders International : Animal experiments : Protecting animals throughout Brexit. On 23 June 2016, a referendum on whether the UK should leave or remain in the European Union took place, on which 51.9% voted to leave. The process of the UK leaving the EU will officially commence on 29 March 2017 with the triggering of Article 50 of the Lisbon Treaty, which gives both the UK and the EU two years to negotiate the terms. Although it is expected that all EU legislation will be incorporated into UK law through a Great Repeal Bill, such laws could be amended or dropped at any time in the future. It is therefore vital a commitment is secured from government that laws concerning animals are not rolled back; there are also opportunities to strengthen current measures. 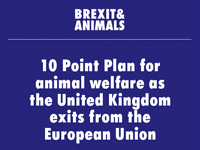 ADI is working to ensure animal protection is not lost in the Brexit negotiations with our campaign partners. 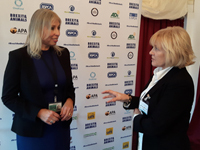 In February 2017, ADI, APA, Cats Protection, Compassion in World Farming, OneKind, the RSPCA, The Donkey Sanctuary, the USPCA, World Animal Protection and World Horse Welfare launched a 10 point plan for animal welfare at the House of Lords. ‘Brexit & Animals’ covers a range of animal issues currently governed by EU regulations, including animal experimentsThe Prime Minister has stated that “We will maintain the UK’s high standards of food safety and of animal welfare, that will be a priority for us” and the government has previously indicated EU legislation on animal experiments will continue to be incorporated within UK law. We will however be working to ensure this is the case. Decades of progress have seen the replacement of outdated animal tests with advanced non-animal techniques. The prospect that Brexit could turn the scientific clock back, returning to outdated methods, is a real concern. Researchers in the UK have previously called for less regulation and may well now press for “cutting through the EU red tape” to make it easier to test on animals, with less scrutiny and oversight. 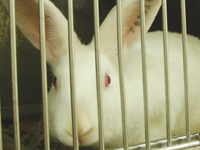 While the UK is unlikely to allow cosmetics testing on animals, the EU Cosmetics Directive also bans the import of products that have been tested on animals. This key Directive prevents countries such the USA, China and others from selling their cosmetic products in Europe if they have been animal tested. Proposals to reform Section 24 (the ‘secrecy clause) of the Animals (Scientific Procedures) Act 1986 (2012 Amended) (ASPA) are now also uncertain. Three years have already passed since a government consultation on freedom of information and Section 24 and no decisions have been given. Section 24 of the ASPA places a blanket ban on the release of details about animal experiments, preventing wider public and scientific scrutiny of decisions made by Home Office officials. Ask your MP to urge the government to maintain, and improve, current animal welfare legislation.